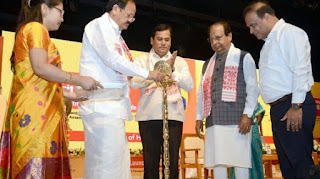 The Vice President of India, Mr Venkaiah Naidu has recently launched the Atal Amrit Abhiyaan in Assam. It is a cashless scheme which will cover 92% of the state’s population with annual income below Rs 5 lakh. It is an ambitious health assurance scheme which seeks to provide access to quality medical care to 3.2 crore people of Assam. There is a dire need to create health coverage schemes that would provide widest coverage to the young, aged and infirm and to those suffering from both critical acute and chronic ailments. The modern day lifestyle is such that it is leading to various non-communicable diseases. According to WHO survey half of the people of the world cannot obtain quality health care facilities and 7 per cent of the people of the country run out of money because of emergency health situations. Therefore some efficient efforts are required in this direction to arrest the growing incidence of such disease which is affecting even the young. There has to be concerted efforts from all stakeholders in healthcare to raise awareness among the people on the dangers of leading sedentary lifestyles, eating junk food, harmful use of alcohol and tobacco. Atal-Amrit Abhiyaan is a comprehensive coverage for six commonly prevalent and high cost diseases involving 438 procedures under which every individual of every eligible family per annum will be entitled to financial benefits of Rs 2 lakh. Launching Atal-Amrit Abhiyaan for the people belonging to BPL (Below Poverty Line) and APL (Above Poverty Line) is a noble endeavour for making health care facilities within the reach of everybody. The people covered by the scheme will get quality tertiary medical care for six specialties requiring hospitalization for surgeries and therapies. They will be getting the medical care through an empanelled network of hospitals—public and private hospitals within and outside the State. Around 438 procedures with the six specialties have been approved for treatment in empanelled network hospitals. The six disease groups identified for financial support are: Cancer, heart disease, kidney disease, neurological disorder, neonatal diseases and burns. The enrolment is free for those from BPL families while members from APL families will have to pay a nominal sum of Rs.100 for enrolment and renewal. Mr. Maidu mentioned that though diseases like polio, tetanus and others have been controlled, non-communicable diseases are still prevalent. This increase in the number of non-communicable diseases is due to the changing lifestyle and people’s increased indulgence in sedentary lifestyle. He, therefore, urged upon the State Government to make physical exercise and yoga as a mandatory component in school curriculum. He urged the Assam government to open medical colleges and healthcare centres in rural areas since there is a shortage of medical manpower and medical facilities. The state government has earmarked Rs 400 crore for the scheme in the financial year 2018-19.